It has been quite an miserable day here in the Central Tablelands of NSW. There was a -3 degree frost to start with. I have to admit that it was very pleasant early this morning sitting in the sun at the Growers' market sipping excellent coffee, eating a bacon and egg roll and chatting with friends. Soon after however, the day clouded over, a cold wind got up and a sprinkling of raindrops was hurled across the dry brown lawn, and over the frost-bitten garden. We are in for a wintry week with very low morning temperatures and winds being blown north straight off the Southern Alps. I ventured out again this afternoon to find a six for today and it was a very short sortie indeed. 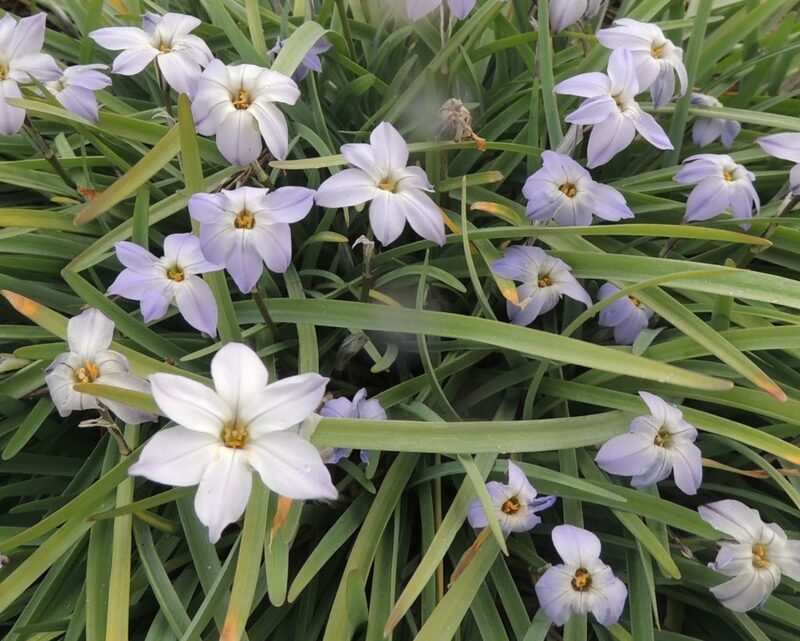 TOne: I think this is Ipheion uniflorum which provides a nice spot of colour in late winter. It will end up being a nuisance I'm sure, as it multiplies very rapidly, but in the meantime I'm enjoying its blue blooms. Two: No ID jonquil. I think it's gorgeous: such a lovely creamy colour with that tinge of yellow in the centre. Three: Prunus blireana is just coming into flower: flowers that could well be dislodged by tomorrow's gales. 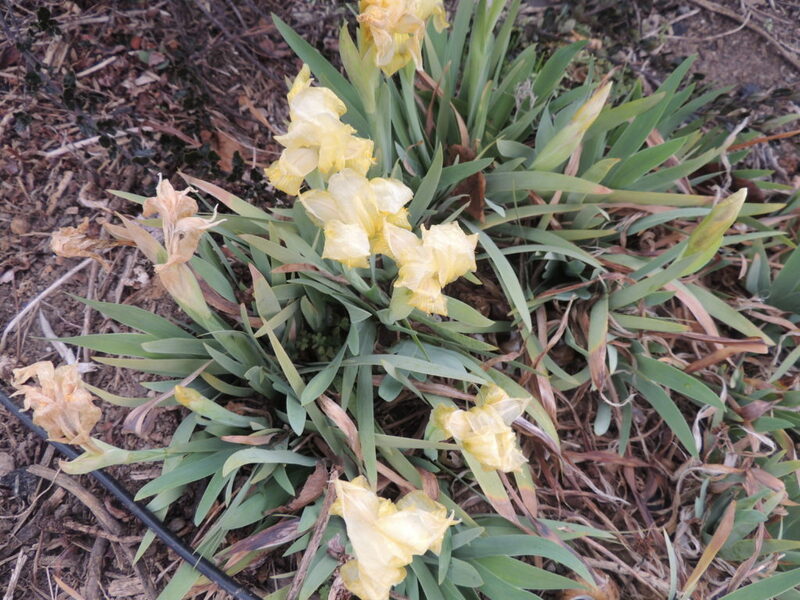 Four: Last week's iris has produced more blooms. Five: Tulipa 'Double Margarita'. 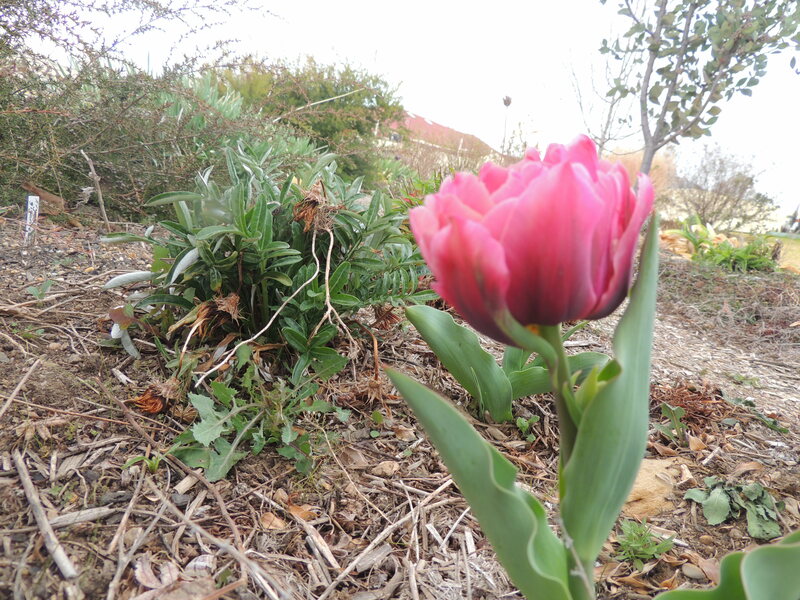 The stem of this tulip is very short and the buds appeared at ground level. Is this normal, I wonder, or is it to do with a lack of rain? I expected these blooms to be swaying voluptuously on svelte stalks, but instead they're vertically challenged blobs. Six: Acacia baileyana or Cootamundra wattle. I'm cheating a bit here as this isn't in the garden, but it's nearby! In fact, it's everywhere, self-seeding very readily, and because of that it's suggested by environmental groups that other wattles should be grown instead. However, a sure sign that spring is on its way, is when Cootamundra wattle begins to flower. And that's my six for this week. Under the guidance of our illustrious leader the Propagator, other gardeners are showing wonderful things going on in their gardens. Do take a look. Next Post Mintaro: a step back in time. Very pretty despite being wintry. Lovely photos that I’m sure refresh a winter soul. Thank you, Cindy. It was nice to be able to find a few cheery flowers. Wow, I still think that your plants look amazing. Even in cold weather, you have loads of color. At least, in comparison to our frigid Midwestern early springs. The prune flowers are so beautiful. It would be a shame if they only lasted a day. Fingers crossed for you. Thanks, Jo. I guess some of the flowers will cling on, and we think it’s very cold, but it isn’t really, compared to the Northern Hemisphere! It was the iris that threw me. I figured your mid August was equivalent to our mid February, and everything in you six fits except the Iris, which is months too early. Even the wattle grows here, though people usually plant the purplish leaved form and it doesn’t self sow. I don’t know what kind of iris it is, Jim. I keep hoping a sixer will enlighten me. The prunus is my favorite of your six this week. It’s gorgeous, Mala, and one of the earliest flowers to make an appearance, so it’s most welcome. Lovely flowers on an upleasant day! Thanks Cathy, they’re very cheerful. That Prunus is completely delicious. Is your tulip a few years’ old? This is the first year I’ve grown tulips, Ali, after lusting after yours and others in the northern spring! It’s the first tulip flower to appear and I’m a bit disappointed in it. I have others that are much more exuberant in their leafiness, but their buds haven’t made an appearance yet, so I’m hoping for something with a bit more of a wow factor. I hope the lack of rain hasn’t had some bearing on their flowering capabilities. Just heard the news that a cold front is extending over Australia’s lower eastern half and thick snowfalls on the alps. Canberra is expecting -3. so I’m not surprised it’s freezing cold up your way, Jane. That Jonquil is gorgeous. The colour is like buttermilk. 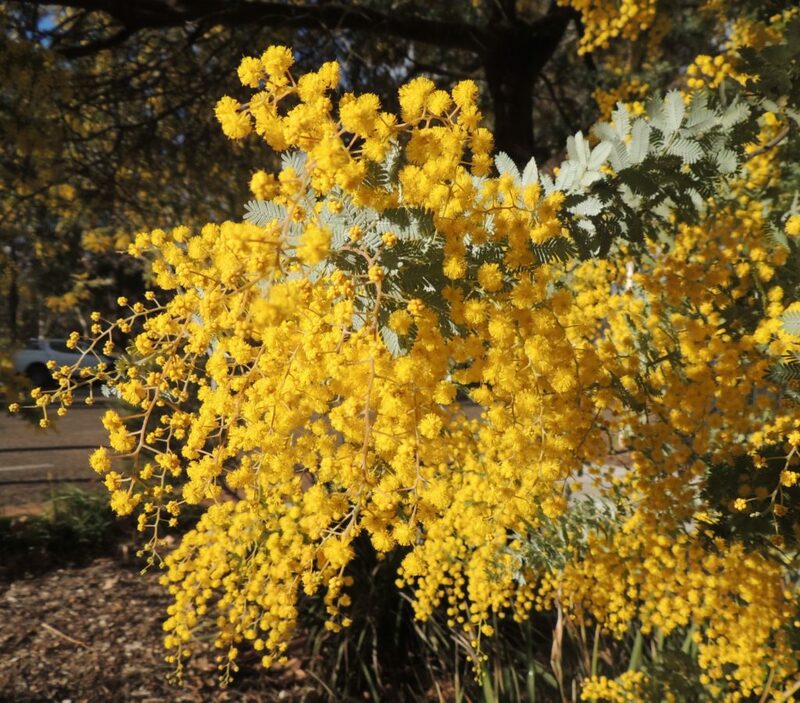 The Acacia is just gorgeous too – the colour stunning. We had what looked like hail late this afternoon in Melbourne and it went very dark and gloomy. I could felt the temp drop rapidly indoors and put the heater on again. My Brother and his partner are coming down from the country soon (next Sunday or the Sunday after I hope) and we’re co-ordinating veggie planting. He’s growing more and more heirloom varieties on his 10 acres and even going for another season of Amish Tomatoes – he mentioned they cropped abundantly and probably better than my Bunnings “Tomato Patio” which I asked him to get for me. They are going to help me out (physically) by overhauling some pots and bringing me fresh potting soil and some Tomato & Chive Plants…..and my much sort after Lemon Verbena. I’ve been chasing it for about 18 months in my local Bunnings. Maybe Bunnings, being the only nursery in this area (with me having no car), has no demand for Lemon Verbena. It was so common on the other side of Melbourne in years past. I’m just not up up to the usual balcony garden tidying and potting this Spring, but maybe I’ll recover my energy in a few more days. Maybe I just need to rest a bit more for wee while (after the Hospital Stay). I’m pleased to hear you’re having some help with your gardening, Vicki. I had a quick search online for lemon verbena seeds and it’s certainly a difficult plant to source. Good luck with that. I’m interested to hear your brother has so much success with tomatoes. Is there no fruit fly where he is? I’m considering not planting tomatoes this year, because QFF usually infects them so badly and without rigging up some kind of exclusion netting it’s nearly impossible. I’ve tried companion planting and I don’t want to spray. Stay warm and well, Vicki. I’d be very happy for the Ipheion to self-seed. I grew some for the first time this spring, but in a bowl. Hope they come back next year. And I love the Acacia pom-poms. So vibrant. Bring back memories of Western Australia in August 2003. I don’t know if the Ipheion self seeds, but the bulbs multiply very rapidly so you’ll soon have a lot more, Jude. I’ve had mine in only a couple of years and the little groups I first put in will join together soon. Ha ha, I nearly added another bird (a red-rumpled parrot) this week, because I was a bit short of ideas! I love the raspberry ripple colour of the Prunus flowers – hopefully they don’t get beaten about by the gales too much! Me too! They’re not all completely out, so perhaps they’ll be ok. Strange to see winter/spring flowers at this time of year,!! Pretty Six. Thanks…I feel the same when I see your spring flowers and we’re getting ready for winter! The unidentified jonquil looks like Erlicheer to me and should have a beautiful fragrance. So lovely coming into early Spring! Enjoy your garden! I wondered that myself, Jane, but when I looked at Erlicheer online I wondered if it might be a bit too white for my jonquil. I’ve had it a few years and I’m much more careful about keeping track of names now! Certainly it’s flowering early enough. Thanks for dropping in! That cold weather is set to reach us on Monday which is disappointing news, because it has been glorious for the past week. Yesterday we had blue sky and sunshine. We went to Brisbane for the day and it was 28 degrees! Amazing. I heard there is even some rain forecast. It won’t be enough but any is welcome at this stage. Your early spring blooms are gorgeous and I hope they survive this cold blast. Thank you, Carol. We’ve had beautiful weather for the past week too. I hope we get some rain with this change, but it’s very unlikely. So dry here…. -5 forecast tomorrow! Stay warm. Interesting! I’ve never even heard of a wattle before. Fascinating flowers! Hi Nate, these are Australian natives and there are hundreds of different ones. When they’re in flower, they’re spectacular. Also Australia’s National flower is the Golden Wattle. You might know them as acacias. Those blooms must have been nice to see. Something is happening in your garden. When I returned after my two week holiday I wandered if anything had changed at all! I do not have any flowering ornamentals anymore. 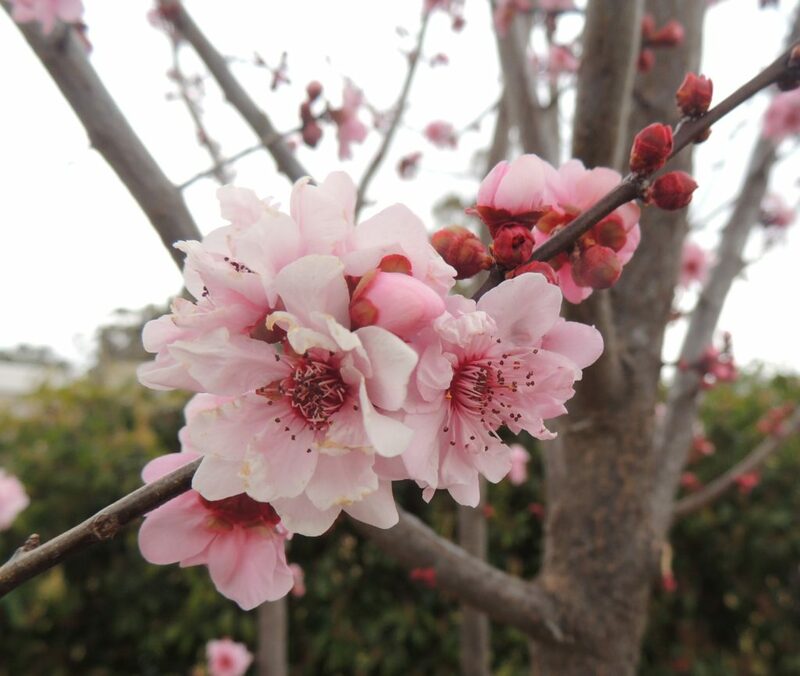 The wind blew over my ornamental plum when it was heavy with blossom, and the possum ate all the new shoots of my ornamental apricot after we had to pruned it hard away from the power line. It never recovered. But possom survived. I hope you have a few flowers left after the expected windy day, Jane. Thanks Tracy, I’m sure we will, and if not on the prunus, there’ll be others elsewhere in the garden to bring pleasure in the coming months. We see people dressed in very light clothes here too, Gerard, while we’re all bundled up in jackets and scarves! Well it all looks Springlike, even when it’s so cold. That happens here too. But it does serve to remind you of all the warmer days to come. It does indeed. I shouldn’t complain about the cold- our winter is nothing really and we so often have glorious days after frosts. 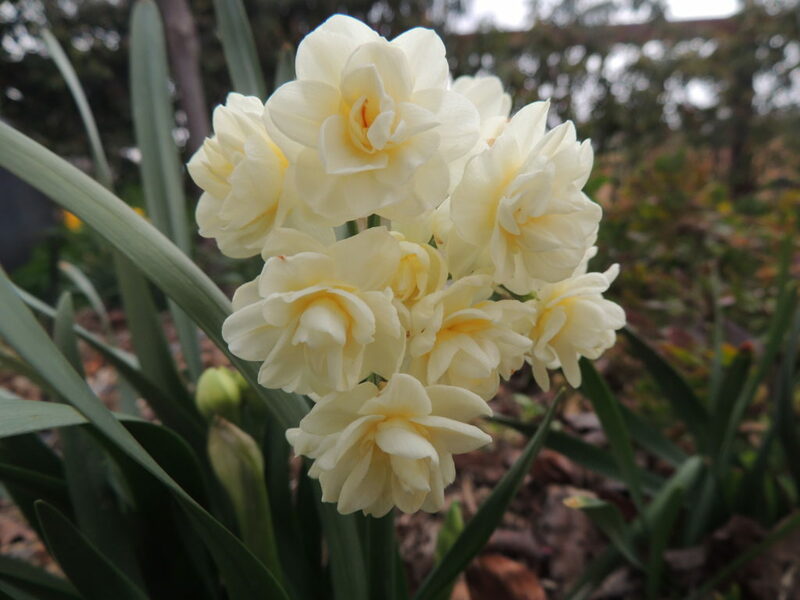 Hi Jane the jonquil is an Erlicheer I have many in my Melbourne garden and I love the scent and the colour – they also multiply really well. Thank you Christine, that’s good to know, the more I have, the happier I am! Tulips! That reminds me, i have some bulb catalogues to browse through. Hopefully most of this year’s bulbs will make an encore but just in case….! a lovely Six, plenty of colour despite the wintry feel. The prunus is particularly good. Thanks Mr P. I’m hoping I’ll have some more tulips before too long. Fortunately the prunus seems to have survived last night’s battering wind. Despite your hideous weather, you found some choice selections for your SoS, Jane! I’m surprised to see Iris blooming at the same time as tulips (not that I’ve ever had much success with tulips). I can’t comment on whether that bloom pattern is common in tulips but I’ve seen much the same thing happen here with crocus. In that case, I blamed it on a combination of inadequate water and inadequate winter chill but it sounds as if the latter probably isn’t a factor in your situation! It’s been so hot over here this summer, I quite long for cooler days ahead. You have all the wonders of spring to look forward to. That Acacia is glorious! Too bad it’s a bit of a thug – I would love to grow it, but I bet it’s not hardy here. Maybe as an exotic annual? I’m not sure exactly where you are Anna, so I couldn’t say whether or not Cootamundra Wattle would be happy. 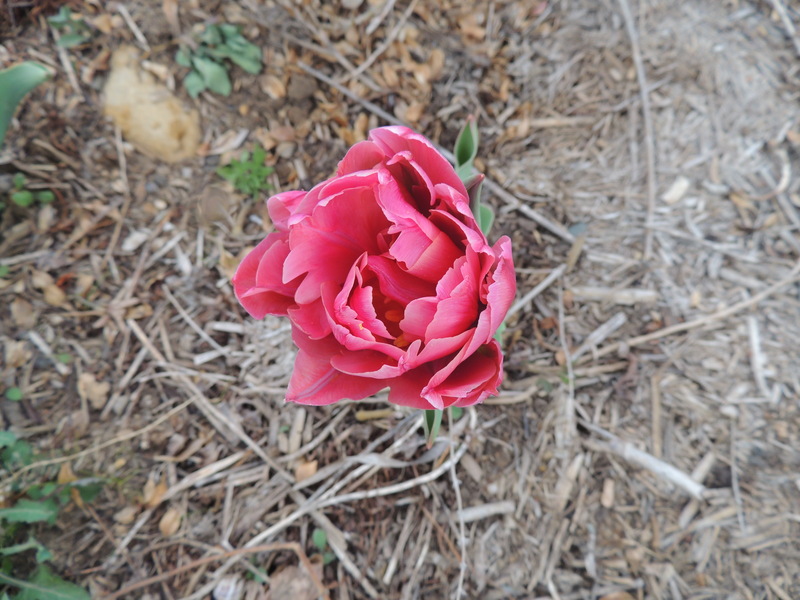 It’s pretty hardy and survives heavy frost and scorching heat in our area without missing a beat. It mightn’t be a thug for you. There are hundreds of different wattles, so I’m sure if that one didn’t suit there would be another one just as bright and yellow that would. It’s a small tree, so wouldn’t be suitable as an annual. Great Six. It’s lovely seeing your spring flowers just as I’m ordering mine! I was thinking along the lines of the Quilting Gardener – it’s time to order spring bulbs & here you are, giving us great examples of spring colour. And what great colour it is, too. Hopefully you’ll be headed into warmer weather soon, so you can spend more time outside, having coffee w/friends. Thanks Lora, I’m away from the garden for a couple of days and wondering what has burst forth in my absence! Still some frosty mornings ahead. I’m always intrigued by the upside down nature of the seasons between the two hemispheres. Lovely to see your spring flowers Jane, what an exciting time for you with ever more flowers to enjoy as the weather gets warmer. I’m out in the garden every day, looking at what might have changed overnight! You probably don’t have time with all your veg growing!